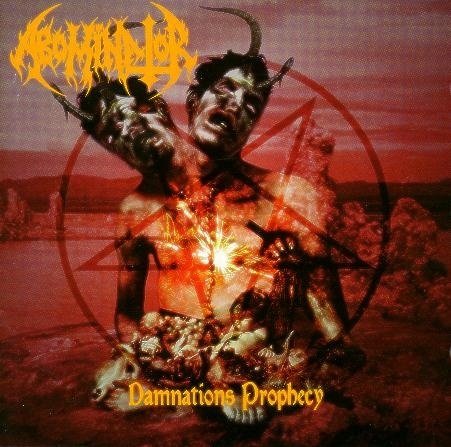 Abominator had probably similar important role in forming the most deviant style of black/death metal, like Blasphemy had about a decade earlier. Their debut could be called as a second milestone on this field, something that no one was able to create in such heavy form before. Earlier there were plenty of tryings to mix the two related styles, but none were so brutal and insane like this direction, and except Blasphemy, Goatlord and Sadistik Exekution nothing similar appeared during the '90s. The overwhelming intensiveness of "Damnation's Prophecy" made the album one of the most influental black/death metal classics. It's not too raw like the ancestors were in this style, but the concept was the same: compromise-less blasphemous rampage, just heavy and fast enough to cause brain damage. And the same important thing is: the album does not sound immature either, it's pure mindless brutality, lacks all sort of aesthetical features and atmosphere. No masturbation on being dark or evil, this record was made to perish all vanity, all emotions, everything. The influence of Carcass could be sensed in the vocal style and the limitless intensiveness. If the goal of Abominator was to create a worthy soundtrack for the apocalypse, they definitely succeeded.